As the weather here in Spain is slowly heating up, in the daytime anyway, it's starting to get that little bit too warm to be wearing jeans, especially when walking to the shops and running my errands. I reckon it's actually been warm enough to rock some shorts, but my pins aren't quite ready to been shown off in public yet! To say they're pasty is an understatement, they're bordering on see through! Anyway, I pulled my old maxi out of the wardrobe and thought, OK I'll give you a go. 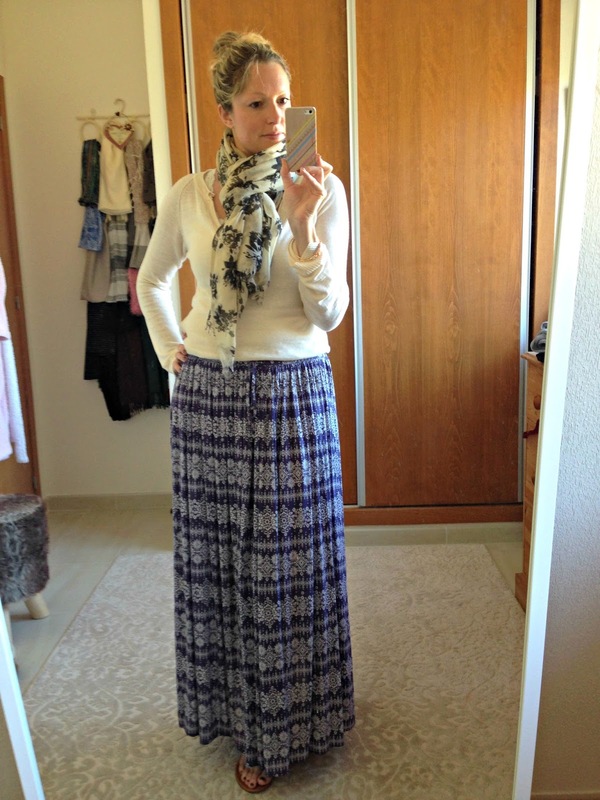 Now, I love maxi's, don't get me wrong! They are ideal for when the weathers warming up and can even be worn in winter with chunky tights and boots, very hipster esque. But since leaving the UAE I haven't been able to bring myself to put one on, as over the five years we were in the desert I pretty much wore the maxi to death! I had quite a selection, but in our last days there, I had to be strict and sell a load of my clothes along with other stuff, as time was ticking and we had to get packed up and Foxtrot Oscar! I'm sure the expat ladies amongst us would understand! So I kept two of my faves, this blue one being one of them. I'm sure if you've followed me for a while now you'd seen it pop up once or twice! Anyway, it's been about eight months since we left the sandpit, so I think I've given myself and the maxi enough space to be able to spark up a love affair again! And I'm chuffed I did. They hide a multitude of sins and are so easy to wear. I've never teamed one up with a light jumper before, but I absolutely love the look. Adding a scarf and simple bangles just seems to pull the outfit together. otherwise, I worry the outfit risks looking overpowered with too much going on. Yep, I think it's time to add a new one to my collection! which you can easily start wearing now with tights and boots and try some knitwear with one too! it's ready and waiting to be teamed up with flip flops and a vest! 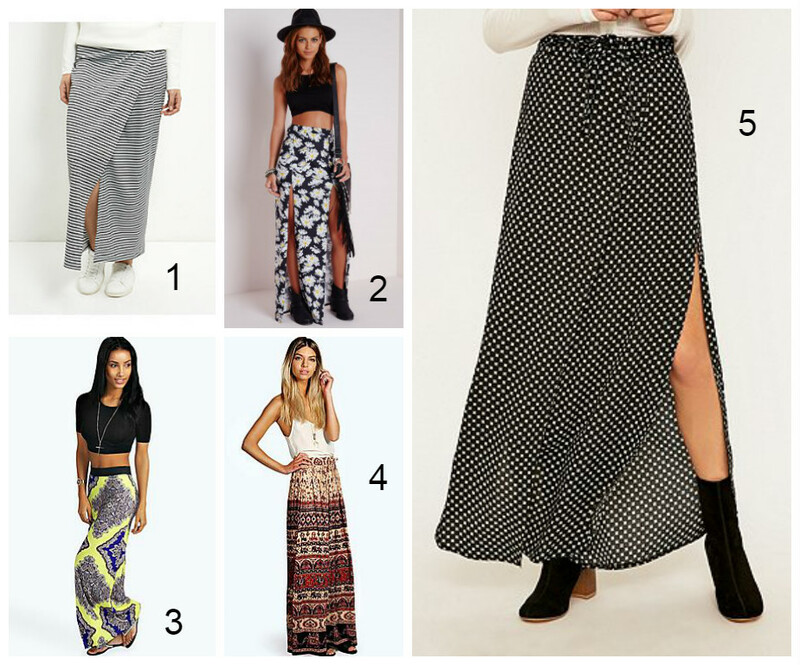 Here's some great maxi's with some awesome patterns! 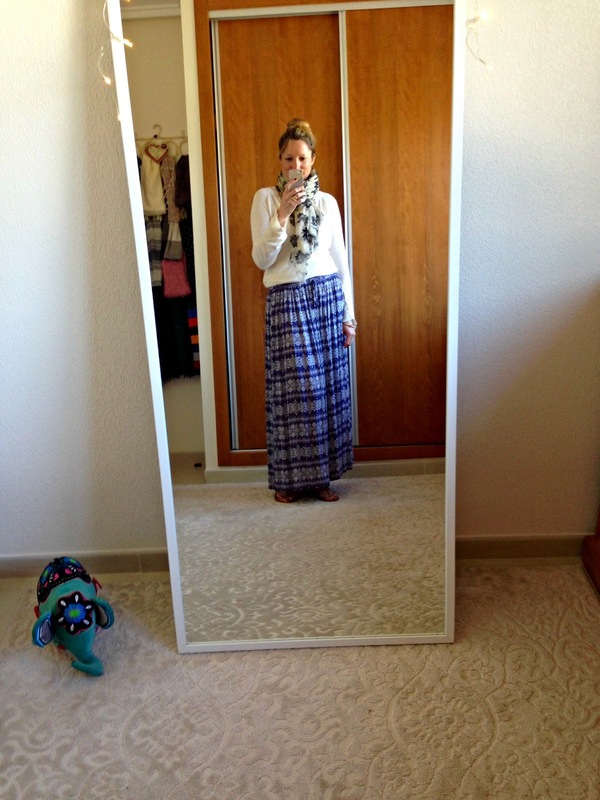 Are you a fan of a maxi? Would you wear one in the winter or just keep them for summer? Love the look of these maxis especially! 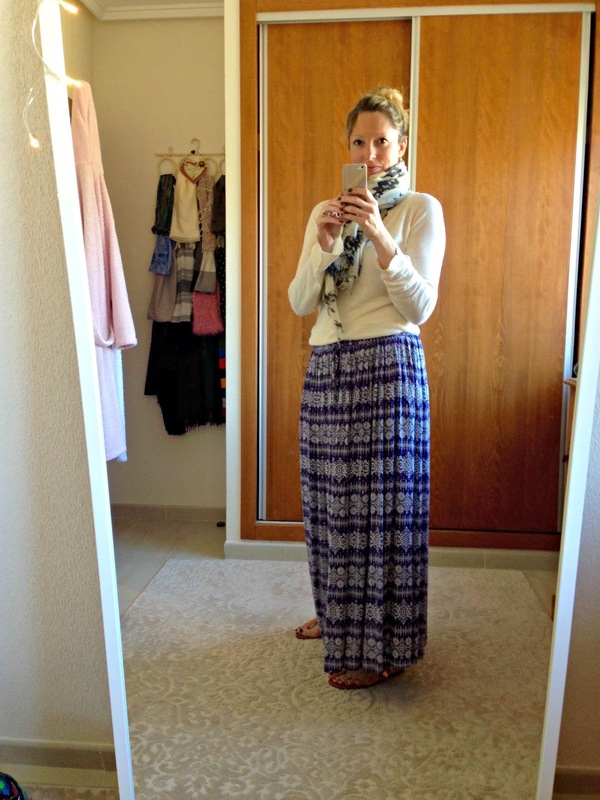 I've got a trip lined up for Sri Lanka and Dubai in May and I'm definitely on the look out for pretty printed maxi skirts for daily wear. Plus, I have a thing for bohemian anything, so outfits like this call my name haha. Thanks Alicia! 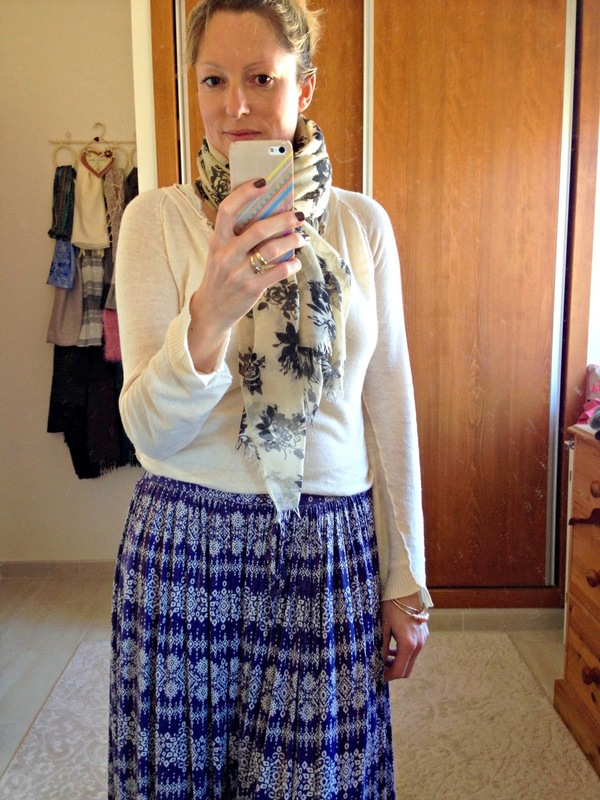 Maxi's are great aren't they! and will be great for your trips especially in Dubai, as it'll be really really warm then, so it'll keep you cool and keeping to the 'dress code' too! This skirt always look fab on you, you can certainly pull a maxi off, don't think I could being 5 foot nothing!